Before reading the blurb, I totally thought this was going to be a werewhale romance novel…I can’t decide if I’m disappointed that it’s not. Captain Ahab’s daughter refuses to let her brother be lost to the sea’s call and the mysteries of their father’s stories. Determined, Morgan tracks down Ishmael and convinces him to help her on a quest to find and bring back her brother who searches for the fabled island of nightmares. When Morgan and Ishmael are captured by mercenaries far out at sea, they convince their captors to head to the island of nightmares where there are rumored to be riches beyond imagination. Once on the island, Morgan’s hopes are dashed as members of the crew disappear one by one as the true secret behind the island’s raw natural power is revealed. Can Morgan and the others escape, or is there some darker power trapping them there for its own fearsome purpose? [Book Review] Will the real Sherlock Holmes please stand up? 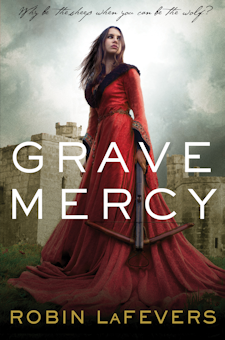 Grave Mercy is middle grade novelist LaFevers’ first foray into Young Adult fiction. And what a great debut! When Ismae’s arranged marriage ends on her wedding night with her husband going to get a priest to burn Ismae for being a witch, the young girl escapes to the convent of Saint Mortain. There, she is told that the scars she had from birth mark her as a daughter of Mortain, the god of Death, and is given the choice to stay and become one of His handmaidens, tasked with dealing death at his bequest. After seventeen years of being a victim, it is no choice at all. Ismae’s first important assignment takes her straight into high court intrigue; Brittany fights to remain independent from France, and the young duchess who can make that possible is besieged by traitors and treason. It is up to Ismae to use her training to unravel the undercurrents at court and serve Death by eliminating the enemies of Brittany. But in the real world, nothing is so straightforward, especially when it comes to the Duval, the duchess’s handsome and tempestuous young adviser–who may just be the traitor Ismae’s looking for. I haven’t had much luck with YA novels recently, but this book has renewed my faith that I can still be blown away. It has suspense, adventure, betrayal, and a well-built, believable romance. The Keepsake is the soon-to-be-released first novel in the Young Adult Empress Chronicles series, a fantastic look at the life of teenage princess Elisabeth in Bavaria—known familiarly as Sisi. 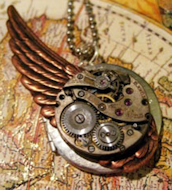 In The Keepsake, Sisi’s magical locket takes her back in time and gives her the power to predict true love—but it also embroils her in a dangerous competition with an evil enchantress who would use the locket to wicked ends. The character is based on the historical princess Elisabeth who goes on to become the Empress of Austria and the Queen of Hungary—a cult figure legendary for her eccentricity: bizarre diets, extreme exercising, exotic pets, a penchant for pink, and a mother-in-law from hell. In other words, the stuff of a novelist’s dreams. The Empress Chronicles brings us Sisi as researched and imagined by Suzy Vitello. And when Vitello’s not busy writing novels and running a popular series of writer’s workshops, she also maintains Sisi’s Blog. She first began writing the blog as a way of organizing her research, as well as delve more deeply into the mind and persona of the 19th century princess. What would Sisi have made of Twitter, blogging, and Facebook gossip? What would she sound like? The result is, by turns, hysterically funny and eminently educational. Often, new writers seem to think world-building only applies to science fiction and fantasy books. It’s assumed that if one is writing a story that takes place in Los Angeles in 2011, the world is already built–everyone knows what’s there, who’s there and how the world around them works, so what’s left to explain? But that way of thinking is fatally flawed. It leads to a story-world full of cliched characters and the unshakeable feeling that something is missing. Judging from the tabloid-looking cover, The Camelot Papers looks like a laugh-out-loud US Weekly meets Arthurian England farce. But that’s not it. The Camelot Papers by Peter David is a series of journal entries written by Viviana, a mid-to-late 20s woman sold into the service of Uther Pendragon and later his son Arthur. Despite her status, Viviana is more educated than the royals to whom she’s indentured, something both Arthur (who admits to her he’s illiterate) and “wizard” Merlin find most interesting. The only trouble is, I’m not quite sure what the cover has to do with the story at all. Yes, there’s humor, but The Camelot Papers also features a lot of serious moments laced with its trademark dark wryness. There are cute scenes and places where I’d smile at something witty Viviana said or something Arthur did that makes him look like an idiot. But not once did I laugh out loud and turn to my roommate and say, “Okay, okay, lemme read this to you…” It’s not that type of humor novel. What kind of novel is it, then? It’s one with a strong narrative voice and intriguing characters. Viviana isn’t a wallflower; she has a voice and she uses it when she can, then braces herself for the consequences. She’s neither abrasive nor rude, but cautious–and insanely optimistic despite what life has dealt her. That outlook on life makes Viviana the perfect narrator. Throughout the novel she doesn’t judge nor wallow in anger at her situation–her own father sold her to settle debts. Instead, she ends up explaining to Arthur that despite her journal filling with entries, she prefers each chapter of her life to start at Day One. That said, she’s not a Royal Historian color-washing Camelot in rainbows and leprechauns. Neither is she a journalist writing a scandalous tell-all book. She’s a fly-on-the-wall, writing a daily journal about the people in her life. And the results are one part dark-realism, one part black humor. That’s what I’ve always loved about David’s writing. Even in the most serious of situations, one line is all it takes to break up the scene. He’s damn good at writing serious scenes and stories, but the humor-laced comments… It’s almost as if David can’t help himself. And really, we don’t want him to. And then there’s Viviana’s imaginary boyfriend, a Knight named Galahad. He’s perfect, he’s awesome, he’s everything Twihards think Edward is… which is pretty close to how Galahad the Pure was in Le Morte d’Arthur. Overall, The Camelot Papers is an engaging read–unexpectedly so. That cover had me thinking it was going to be reading a parody, a la Monty Python. Instead, what I got was a solid, stand-alone story based loosely on the legends of Camelot. For lovers of King Arthur, definitely give The Camelot Papers a read. But don’t go looking for it in your local bookstore; it’s a Nook/Kindle exclusive… and available as a print-on-demand via Amazon. And if this sounds like something for you, there’s more. While David is mostly known for comics and Star Trek novels, this isn’t his first venture into Arthurian mythology with a twist. I highly recommend the Knight Life trilogy (Knight Life, One Knight Only and Fall of Knight) which tells the story of King Arthur’s return to the modern world, and how he successfully ran for mayor of New York City. The Poisonwood Bible is to CanaryTheFirst as Dresden Files is to me. For months, we’ve been harping on each other to read our respective favorite referable books. And I’d like to say that I read it to keep my partner happy. In actuality, I got it because it was dirt cheap in an Audible sale, and I was bored. I’ve been done with the audiobook for well over a week and have had the above paragraph written for at least as long. But I’m drawing a complete blank as to how to continue on with the review. The Poisonwood Bible is the sort of story that demands one check their snark at the door, and I am nothing without my snark. Suffice it to say, The Poisonwood Bible is a damn good book. The narrative follows the Price family—an American missionary, his wife, and their four daughters—into the Congo in the 1960s, a time when the Congolese were fighting for their independence. The Prices’ posting is in Kilanga, a small, poor village along the Kwilu River. While their father attempts to brute force his way to Christian conversion, the daughters, aged 5 to 15, must find a way to survive the year-long posting so many thousands of miles from their native Georgia. 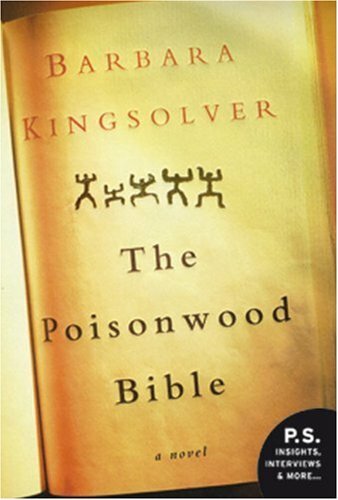 Kingsolver’s prose is a force to be reckoned with. Each chapter is told from the perspective of a different Price woman: Orleanna (the mother), Rachel, Adah, Leah, or Ruth May. The character’s voices are so distinct that even popping back into the recording after a several-day break from listening, I was never had any doubts who was speaking. The strong distinction was especially prominent in the character of Adah, who has a penchant to obtusely lyrical thoughts and multiple-word palindromes. Writing the character must have been at once a joy and curse-word-inducing challenge. If I have one critique of the novel, it would be that the time frame seems unnecessarily long. The narrative traces the women through the better part of thirty years. Several times, I looked at the number of hours left on the recording and said aloud, “There can’t possibly be so much story left!” It made the entire thing seem…anticlimactic. What I saw as the climax actually happened before the halfway point of the book. Either I’m off in my assumption, or it’s the single longest falling action I’ve ever seen. Oddly, lack of climax didn’t make the book any less enjoyable, especially in audio form. The reader, Dean Robertson, was superb 98% of the time—and the other 2% was more due to slips in editing than in her actual reading, I think. In fact, I tried at least three times to pick my roommate’s hardcover copy of the book but found it to be utterly wrong to not have Robertson’s voice in my ears. The book’s prose is almost like a poem; it demands to be read aloud. When I was in sixth grade, I was obsessed with historical fiction. I read every Ann Rinaldi and Avi book on my middle school library’s shelves. At some point, I drifted off to fantasy and scifi, but Kingsolver’s excellent novel of Congolese struggle and an American family caught in their own tragedies reawakened that love of a well-researched historical fiction story, the sort that transports without being overly description, and one that truly brings history to life. It’s a triumph of a novel.